Summary: With the new cloud computing technology where users can request and update their System Mechanic programs to handle the unknown situations whether it is to optimize or repair specific Windows’ problems, Iolo convincingly has optimized their performance in this area. Added that factor with other proven formula of System Mechanic like fast operation, abundance tools and utilities, and two versions to choose from, you will get a package that should be included in your must-have program this year. What We Like: The integration of new cloud computing technology offers a more accurate optimizing and maintenance operation, two versions with two different pricing gives customer more freedom to choose, complete protection (antivirus and firewall) featured in the Pro version, and lastly easy operation with additional features of automatic optimization and maintenance. What We don’t Like: Almost nothing except that we expect Iolo stuffed some features that are related to Windows appearance tweaking. Looking for a Windows all-in-one utilities software is about searching the best combination between tools and utilities being offered, integration of all of these tools into its interface, quality of each tools, and the price of the entire package. These are the reasons we search for such software: To get all of the Windows optimization and tweaking tools in one place with extra additional shovel to dig more out of your Windows. Surprisingly, Iolo System Mechanic satisfyingly fulfills all of these needs although it still has some minor problems. Iolo has been in the industry since 1998, specializing for Windows utilities. System Mechanic itself has celebrated its 9.5 series. Inside, Iolo has stuffed all the tools you need to clean, tweak, optimize, and recover your troubled Windows. Nowadays, the market of Windows tools and utilities has been crowded with so many packages, high and low. Even security software publishers that are famous for their antivirus products like Symantec Norton and ZoneAlarm are already hot on their heels of integrating Windows optimization modules inside their latest products. In the low section market, there are registry cleaner software that only specialized in cleaning your registry. The problem is with its limited capabilities they are not as powerful as they tend to claim. In fact, lots of them related to internet scams. Big players in the industry usually release more-tools-packed software like Iolo with its System Mechanic. And for a while it has gained a good publication from the media. Diving into the package, System Mechanic has two flavors, basic and Pro version. Iolo sells the Pro version at $49.95 while the basic sells at 39.95. The Pro version offers four fundamental extra features that Iolo also sells separately namely Iolo Antivirus, Personal Firewall, Search and Recover, and Drive Scrubber. This pro package should be a better choice if you have not got any antivirus yet. With this package, it directly competes with Avanquest System Suite and Advanced System Optimizer (ASO). But it worth to mention that System Suite $59.95 price tag is way too high. In the other hand ASO price tag while $10 less expensive, but it only offers personal antivirus with less firewall protection. The features of System Mechanic basic version put the package in direct competition with so many great products like TuneUp Utilities, Ashampoo WinOptimizer, Avanquest Fix It Utilities, and again ASO. But once again with its less expensive price, its direct opponent is still ASO. Whoa! Antivirus plus firewall modules (left) are combined with a lot of Windows maintenance tools including file recovery (right) at $50 surely will make security publishers think twice before they jump into the competition. Norton 360 anyone? In the basic package, System Mechanic will help you optimize startup process and memory, cleaning up your registry, tweak your internet connection, clears up junk files, solving miscellaneous Windows errors including by creating bootable CD, customizing hidden Windows settings, and performs diagnostic of your system software and hardware information. The combination of all of these tools is great for optimizing your slow performing PC besides solving several Windows problems. Iolo claims that System Mechanic has more than 40 features. While this might be true in its own right, it seems misleading if we compare it to other competitors. Because what adds up the number might be just sub features that are packed into not more than 20 main features in total. Compare with WinOptimizer, ASO, or TuneUp Utilities, System Mechanic basic version offers less features. You should upgrade to Pro package if file recovery and file wiper are important for you because these features are already come in bundle with the three competitor’s package. What a Windows utilities software would be without a one click maintenance button? Thankfully, Iolo did not forget to include it inside System Mechanic, from a total system optimization and maintenance button (left) to individual aspects (right) like PC Cleanup and PC Repair. From the user interface point of view, System Mechanic is the most technical among others, giving you with lots of texts and less icons. But Iolo has managed to simplify its presentation. For instance, you will be served with 4 main menus: Dashboard, ActiveCare, Tools, and Reports. Dashboard will leave you with instant information regarding your system health. This will gives you information such as how much registry problems you got and how much unnecessary files there are as well as quick access to fix it all. The second is ActiveCare, as its name it will give you the option to make every individual task runs automatically and inform you the status of your antivirus and firewall. If you had external antivirus then it will inform you as well. Next menu is Tools. This will give you access over main modules of System Mechanic like PC Accelerator and PC Repair as well as individual tools. Basically, this is the place when you want to pick a single activity instead of analyzing your entire system in the Dashboard. The last menu is Report which will inform you about technical information of your system and the record of optimization did by the software. Overall, the simple menu design should make up for its less graphical presentation. Comparing overall operation to other similar software, System Mechanic integrates all of its menu nicely. 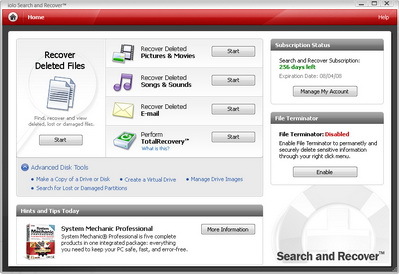 Like Tune-Up 1-Click Maintenance or WinOptimizer Quickscan, it gives you one-click access for all of its features. You can access this whether by pushing the “Analyze” button in the Dashboard or by picking “Start PC Total Care” up in the Tools menu. This aspect of instant access is very important because what’s a Windows utilities software does if all of the functions are not integrated very well? It worth to mention that some of its functions are already available inside Windows like junk files cleaner and hard drive defragmenter. Software like System Mechanic should add more value to it. By automating and integrating all of these tasks in one place does it exactly fill this value. But actually, System Mechanic does not only simplify Windows tools for general user but it also gives them new hope to cope with something that computer geeks can only do with more time and effort like with its registry cleaning and repairing ability. For those of you who are an average users with little time and knowledge and mind to dig deep into Windows utilities, then System Mechanic is for you. Another module System Mechanic offers for general users to even surpass the ability of computer geeks in repairing their Windows is Drive Medic. This module is basically a set of maintenance tools to restore and repair damaged hard drive, partition, and boot records in a case when you failed to boot up your Windows. System Mechanic help you by creating a recovery disk which can boot up your computer and run all of these recovery functions. If the problem is related to damaged partition or boot record, System Mechanic can easily repair the damage and rebuild the boot record so that you can start up your computer again. Although boot failure is caused by various reasons, System Mechanic do address an important point there by giving you very possible scenario of recovery. Putting System Mechanic on system performance impact, although it is quite soft on your system, you should choose ASO or WinOptimizer if you have inadequate system like an old desktop, a decent laptop, or a netbook. System Mechanic needs at least a 400 Mhz CPU, 256 Megabytes of RAM, and 30 Megabytes of HD space. It only supports Windows XP, 2000, and Vista. Despite that, tested on my very old laptop running on Intel Celeron 2 GHz, 1GB of RAM, and 160GB of HDD, it can run very well. Load times are shorter than TuneUp Utilities and opening between module is a brisk, not like TuneUp who needs extra process time. Overall, in the required specification system, System Mechanic operates very well although not as fast as WinOptimizer. As a summary, Iolo offer a very solid package inside System Mechanic both in basic version and Pro version with less price than most of its competitors. The real treat within the price range is Advanced System Optimizer which is honestly have optimization and maintenance technologies far below System Mechanic. And if you upgrade to the Pro package with additional antivirus and firewall among others, it will be your better choice than TuneUp Utilities at the same price range if you are also looking for a complete Windows security protection.